Today’s market is the most over-valued global market in history. The quote “not overvalued” comes from the outgoing Fed Chairwoman who helped achieve this feat. We take a look back at another former Fed Chairman’s thoughts that everything was great and fine and nothing could go wrong just prior to the financial crisis. “But economists are not great knowing what appropriate valuations are,” she said. “We don’t have a terrific record. And the fact that those valuations are high doesn’t mean that they are necessarily overvalued.” Yellen said the low-rate environment is supportive of higher valuations. “We are enjoying solid economic growth with low inflation. And the risks to the global economy look more balanced than they have in many years,” she said. Does the “low-rate environment” support higher valuations? To a point… but we passed that point a long time ago. What low rates really support is low future returns in both stocks and bonds. If you are okay with 1% total annualized returns for the next 12 years, then stocks are not over-valued. But I think it is hard to support the notion that stocks are not over-valued when they have never been this highly valued even in a low interest rate environment. In the chart below we look at market valuations when the 10-year treasury was below 3%. The only two time periods this occurred started in the Great Depression (1934-56) and during the Great Repression Recession (2011-present). We looked at the 12-month trailing PE ratio and the 10-year trailing PE ratio. It seems in both cases we are pushing the upper range of the current time frame higher as Janet Yellen speaks. We are exceptionally higher than the previous 22-year period of low rates. I absolutely agree with that assessment. The Fed has a terrifying track record when it comes to blowing asset bubbles that pop and leave economic destruction in their path. We’ve never had a decline in house prices on a nationwide basis. So what I think is more likely is that house prices will slow, maybe stabilize: might slow consumption spending a bit. I don’t think it’s going to drive the economy too far from its full employment path, though… But I do think this is mostly a localized problem, and not something that’s going to affect the national economy. Nationally home prices dropped 25% from their peak leaving many Americans underwater in debt. As for full employment we not only have 4% less of the population employed today than the last time we were at “full employment”, unemployment moved from 4% to 10% due to the financial crisis created in part by the housing bust. In other words, this entire recovery has really only recovered 2% of the loss while the unemployment “model” recovered 6%. Our assessment is that there’s not much indication at this point that subprime mortgage issues have spread into the broader mortgage market, which still seems to be healthy. And the lending side of that still seems to be healthy. …Lending froze !!! shortly thereafter (and here). Contagion spread to the entire global financial system. The emergency bailouts began and are still ongoing. At least the economy was strong? Well, unquestionably, housing prices are up quite a bit; I think it’s important to note that fundamentals are also very strong. We’ve got a growing economy, jobs, incomes. We’ve got very low mortgage rates. We’ve got demographics supporting housing growth. We’ve got restricted supply in some places. So it’s certainly understandable that prices would go up some. I don’t know whether prices are exactly where they should be, but I think it’s fair to say that much of what’s happened is supported by the strength of the economy. It was not the economy that caused the Great Recession. It was caused by an over-leveraged and under-supervised financial system. Yes, they have cleaned up the banks public balance sheets (if you ignore derivative exposures) through bailouts and transfers from savers to the banks through interest rate suppression. The banks are looking fine publicly so the Fed doesn’t seem to care about the historically over-leveraged US corporations and the over-leveraged emerging markets (to include US dollar loans). “We are enjoying solid economic growth with low inflation. And the risks to the global economy look more balanced than they have in many years,” she said. The Fed assesses whether there would be an economic impact or financial stability concerns if the stock market were to sell off. “I think when we look at other indicators of financial stability risks, there is nothing flashing red there or possibly even orange,” she said. She said the banking system is more resilient than in the past, and there is not a “worrisome buildup in leverage or credit growth at excessive levels. “I think when we look at other indicators of financial stability risks, there is nothing flashing red there or possibly even orange,” she said. She said the banking system is more resilient than in the past, and there is not a “worrisome buildup in leverage or credit growth at excessive levels. What the low interest rate environment brought was excessive debt in the SP500 corporations that now exceeds the 2000 and 2007 market top levels significantly. Debt to earnings ratios today also exceed the highs during the last two earnings recessions. Never have corporations been more vulnerable to an economic recession or rising interest rates. This is true for bond funds too. In the chart below we see that a 1% rate shock would result in $1.2 trillion dollar loss in the Barclays US Aggregate Index (tracked by the TSP F fund and AGG ETF). So I guess that’s all that matters. Good job Janet Yellen – you exited just in time. 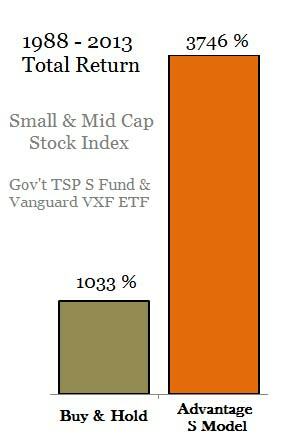 TSP & Vanguard Smart Investor agrees that market risk is elevated and that we need to be alert to indications of investor preferences shift from holding to selling risk assets. Because in the end, it is those who buy and sell that drive the prices.